Springtime coming - "hit the deck" | A.B.E. Remodeling, INC.
With spring time in the near future, yes it is just around the corner and winter will be leaving us. So it's time to inspect your decks, porches, and patios. It's time to think about re-staining your decks or repairs that may need to be done. 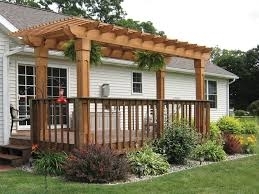 You might even want to consider a pergola to make a shady relaxing area. Yes, we can help with any of these things-we are booking projects now....so give us a call to talk about your thoughts. Remember it will soon be spring and time to spruce up your home. We look forward to answer your call. Have a terrific Thursday. Blessings be yours in abundance.